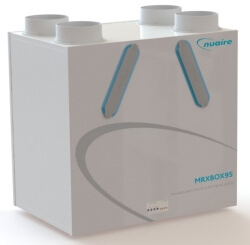 An MVHR installation accomplishes this by taking stale air from inside the home, extracting heat energy from this via a heat exchanger which pre-warms clean fresh air brought into the home and circulated around the house. What are the benefits of installing an MVHR system? Prevent condensation problems by removing the airborne moisture arising from every day activities such as bathing, drying clothes, washing up and even breathing. Trapped moisture causes mould to develop and can damage decoration and building fabric as well as give rise to health problems. Promote a healthy living environment. Airborne allergens are reduced and up to 95% of airborne dust and pollen particles are filtered from the supply. Good news for asthma, allergy and hay fever suffers. MVHR reduces a households primary fuel cost by 10 to 15% a year by conserving up to 95% of the heat from the exhaust air and using this to pre-warm the clean fresh air supply. Household odours are removed without losing heat though open windows. Improves the energy efficiency SAP rating of a home to meet the ventilation standards required for new homes and can even help achieve Passivhaus standards. Low maintenance requirements with few moving parts, air filters requiring replacement typically once every five years. Although not an air conditioning unit, MVHR units provide a degree of climate control and can cool incoming supply air in hot summer months. Stale air is extracted from the wet rooms in a home such as kitchens, bathrooms, utility rooms etc., and taken through ducts to the MVHR unit. Within the MVHR unit the moist exhaust air passes through an air to air heat exchanger which transfers the thermal energy to clean fresh air drawn in from the exterior. The two air streams do not mix. The warmed fresh air is then distributed by a quiet fan through ducts to the living rooms such as lounges, dining rooms and bedrooms. The system is balanced at installation to achieve the required ventilation rates for each room. What properties are suitable for MVHR? It is simplest for MVHR to be installed during construction or major property refurbishments to enable concealment of ducting. This makes it ideal for self-builds and new homes though where construction elements permit it and can also be retro-fitted in to older housing stock. MVHR is also suitable for installation into commercial buildings such as offices, shops, etc. MVHR units are compact and can be located in lofts, roof spaces, store rooms, and smaller units in wall mounted cupboards. Using high efficiency and quiet fans they will recover up to to 95% of the heat from the expelled air. Whatever the age or construction, MVHR units perform best in buildings that have a good degree of air tightness. To find out more about MVHR contact Fervo Renewable Energy on 0333 240 2121 for an informal chat or make an enquiry .